Halloween day finally arrived and it was definitely chaotic! Our neighborhood had a power outage until around 3:00 pm, so needless to say I was trying to get everything done in a short amount of time. 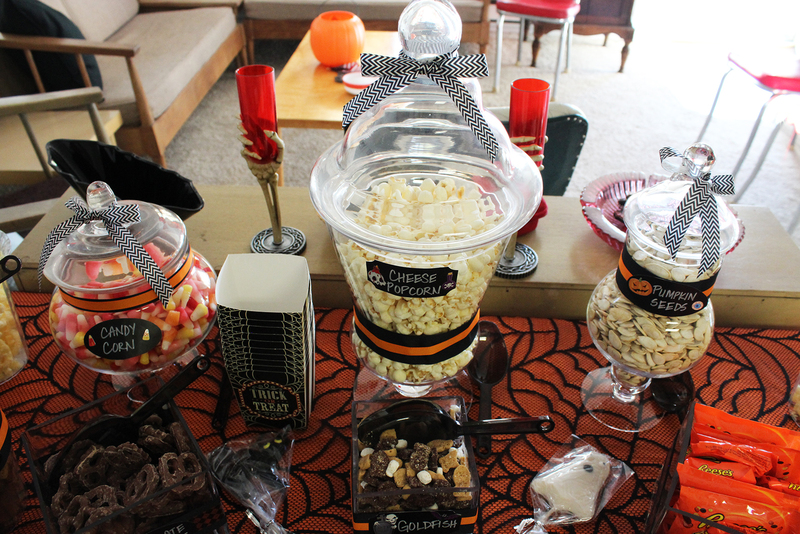 I thought I would share with you how the candy buffet turned out and Cherry’s Rosie the Riveter costume. 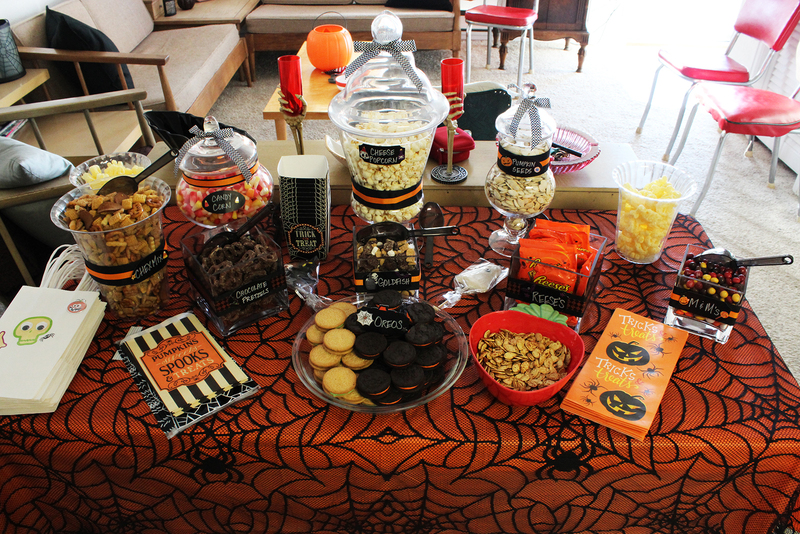 Here is the finished candy buffet for Stan’s birthday party. I really like how it all turned out, the color palette flows nicely and the candy and snacks are everything Stan loves. My favorite is the last minute table cloth we picked up at the grocery store. Another view of the buffet. 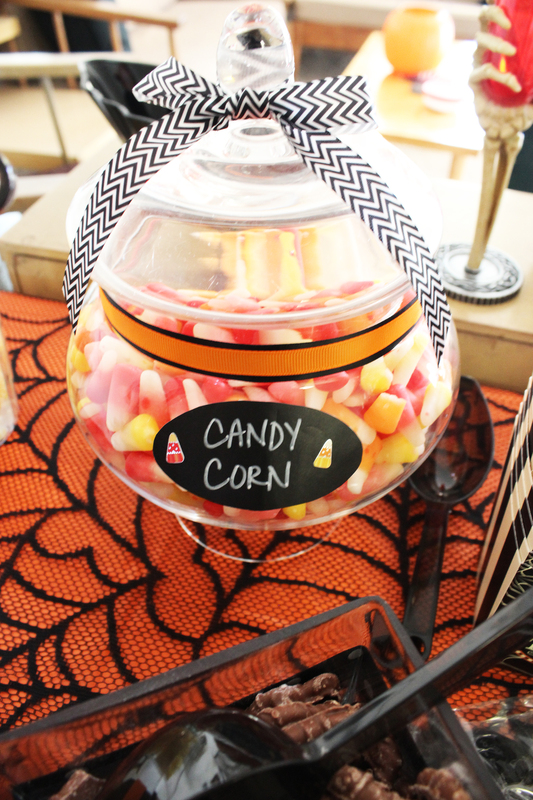 I love how the apothecary jars make the buffet look expensive and well put together. Thankfully my aunt already had these and she let me borrow them. A close up view of one of the jars and detail of the ribbon and labels. I like how the ribbon combination and labels really go together nicely. This is actually the hard part! Finding the perfect ribbon and then making it all flow. 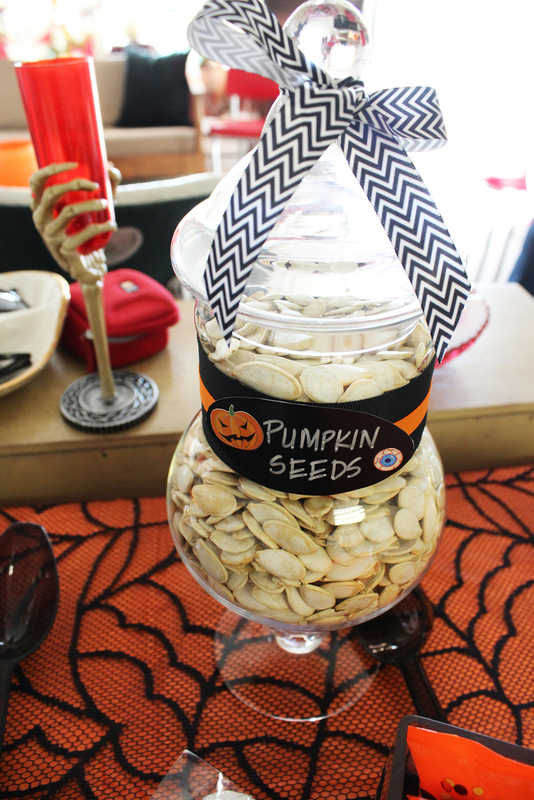 It took me about 4 tries of putting different ribbons on the jars to see how they look. It all has to be perfect! 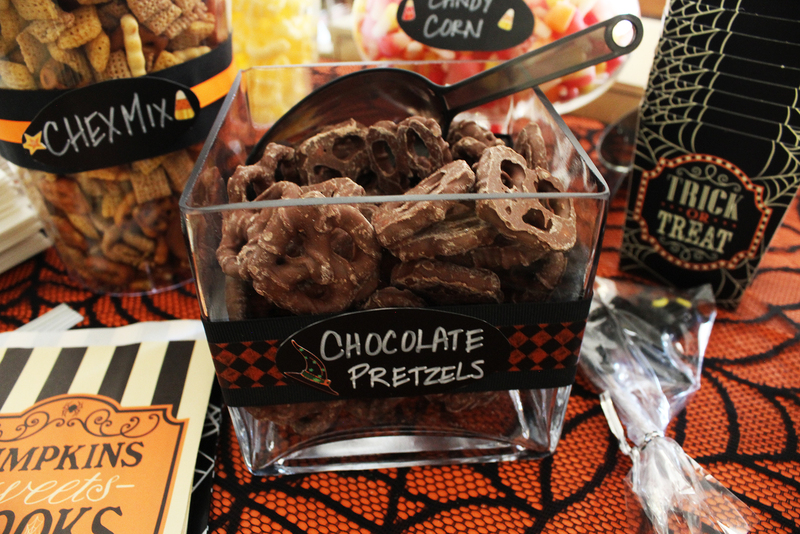 On the pretzel jar I used thick black ribbon and some washi harlequin tape. I found that worked nicely on the square jars. It was also a challenge trying to make the whole thing feel masculine since it was for Stan. Here are the Rosie the Riveter costumes! I really like how they turned out. Cherry’s coveralls were so adorable and she really did feel cute in them all day. That is exactly what I was aiming for when deciding what she should be for Halloween. I wanted her to be comfortable but also cute. Here we are trying to take a good photo in the garage next to the hot rods. I put together the whole costume and got most of it on ebay. 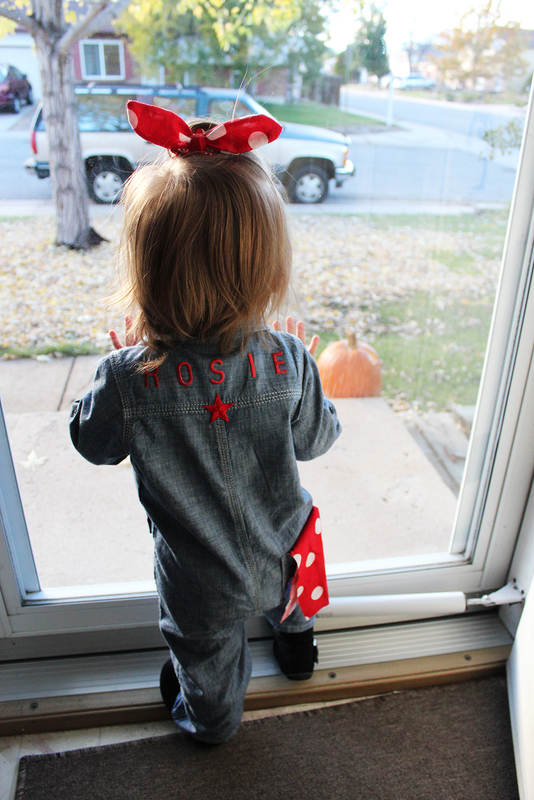 The jean coveralls and “We Can Do It” Rosie pin are from ebay. The engineer boots she had, the hair bow I made and the patches were from Hobby Lobby. She also had a plastic wrench but that ended up staying in her trick or treat bag. I was a bit disappointed because she wasn’t feeling well that night. She powered through though as Rosie would. The back side of her costume. I added the polka dot rag to her back pocket last minute and I never told her about it so she wouldn’t mess with it. I think it topped it all off. 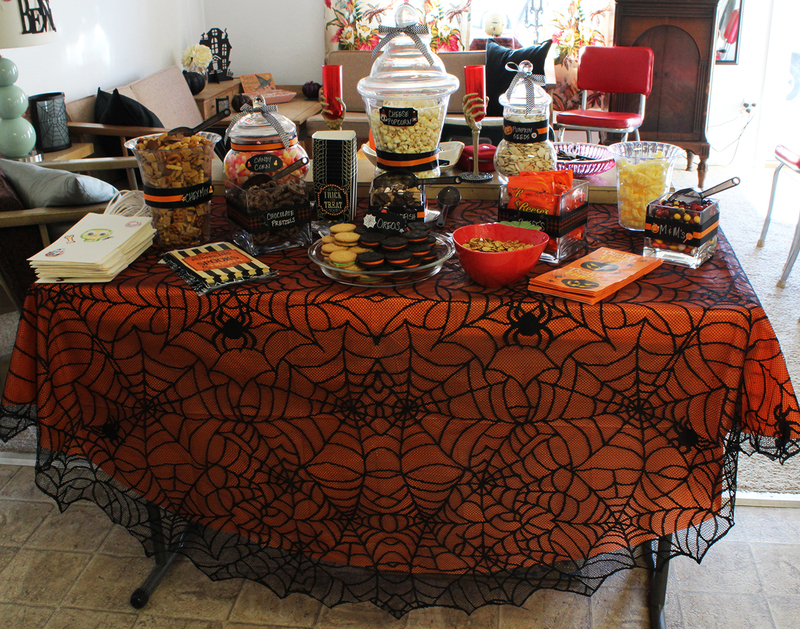 I hope you enjoyed seeing my candy buffet and Cherry’s costume! If you are excited about the Holidays coming up, then stay tuned because I will definitely be posting about Vintage Christmas.